Australia’s leading domestic tour operator, APT, was named the winner of the Qantas Award for Excellence in Sustainable Tourism at the prestigious 2014 Perth Airport Western Australia Tourism Awards. 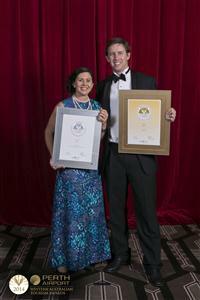 APT also picked up a Silver Medal in the Major Tour and/or Transport Operator category at the awards, which saw medallists awarded in 30 categories at a Gala Dinner held at the Crown Perth on Saturday 25th October 2014. In addition, APT Driver Guide and Cruise Director, Jane Ballantyne, was also a finalist in the FACET Golden Guide Award category. Now in their 42nd year, the awards are designed to recognise and reward the extraordinary tourism experiences and services that Western Australia has to offer. They showcase the best in the industry for their outstanding customer service, innovation and ongoing business excellence. APT has been operating in the Kimberley for 40 years and its operation comprises a fleet of custom built 4WD vehicles which are used as part of its land touring program; a luxury small expedition ship which it has brought to the Kimberley to operate as part of its coastal cruising program; and also offers a network of Wilderness Lodges at the Bungle Bungle, Bell Gorge and Mitchell Falls, offering understated luxury in the outback for its touring and self drive guests. Pictured with APT’s awards from the night are Driver Guide and Cruise Director Jane Ballantyne and General Manager for the company’s Kimberley and Outback Wilderness Adventures, Rob Tandy. To find out more about APT’s award winning Kimberley land touring and coastal cruising programs call 1300 196 420, visit kimberleywilderness.com.au or see your local business development manager.